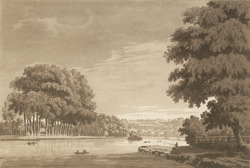 The villa of Twickenham Meadows was enlarged in the mid-18th century, and later became known as Cambridge Park. It was the largest estate in Twickenham after Twickenham Park. This view looks towards Richmond Hill, a fashionable area in which wealthy gentleman built their country homes. Overlooking the Thames valley, it became an increasingly popular town from the 16th century on.